It’s Time to Get Goal-tastic! Happy Sweet Shoppe Saturday everyone and welcome to my first new release of 2013! I love the beginning of the new year. I love the chance to start fresh with new goals, intentions and projects. But let’s face it, for us creative types, the process of goal-setting can be a little bit, shall we say, boring and intimidating. Which is why I’ve always loved the idea of One Little Word. You choose one word to represent your intentions for the year – just one. That’s not so hard, right? But what they don’t tell you is that choosing your word is the easy part! And I’ll admit, despite my love for OLW I haven’t always been the best as keeping my word front and center all year. I’m guessing the same is true for you. We have busy lives! In our tech-driven world, it’s easy to get distracted by important stuff like news and work…and…Facebook. Which is exactly why I designed this week’s new releases: to give you a fun and creative way to capture your goals and stay focused on your One Little Word all year long. My reason for packaging these two template sets together is simple. The key to achieving your goals is pairing action with intention. It’s not enough to think about what you’d like to achieve – you have to actually do the work to get there. Here are a few more sample layouts from Team Awesome. I love seeing the mix of words: enjoy, magnify, active, time, intention. Since Brook isn’t doing One Little Word, she chose to use the template to record some of her favorite sayings from her daughter – which is a super cute way to use this template as well! 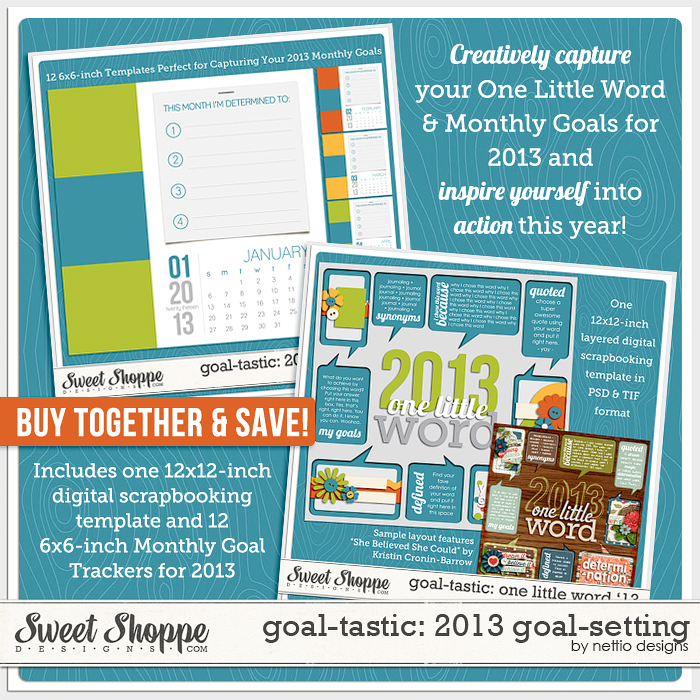 The second piece of the Goal-tastic: 2013 Goal-Setting bundle is the Goal-tastic: 2013 Monthly Goal Tracker. Once you have set your intentions with your One Little Word for the year, the next step is to take actionable steps toward making your intentions a reality. But I don’t know about you, in the midst of a busy month, it can be really really easy to completely forget about the goals I set no matter how good my intentions may have been. Which is why I designed these 6×6-inch monthly goal trackers – to give you a creative, fun and easy way to capture your monthly goals and keep them front & center all month long. 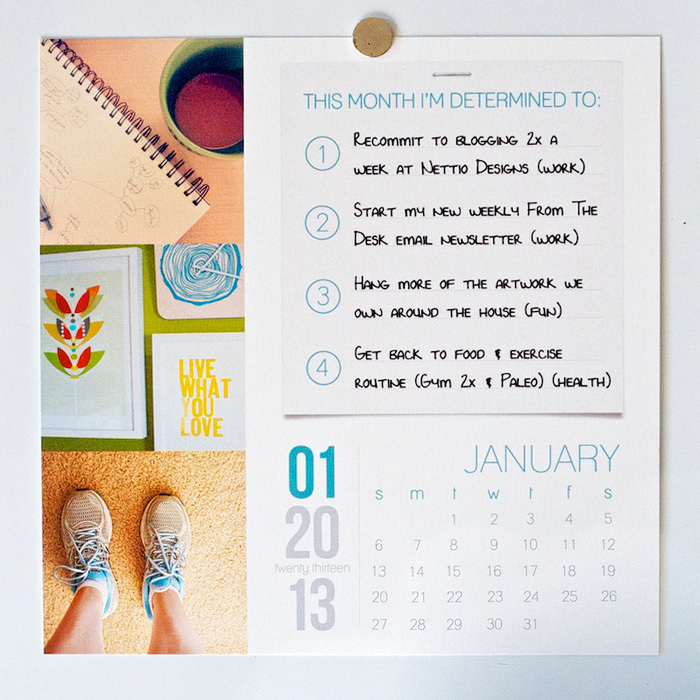 Just write down your goals, embellish your page in a creative way that inspires you, print it out and hang it in a prominent place where you’re sure to see it all month long. 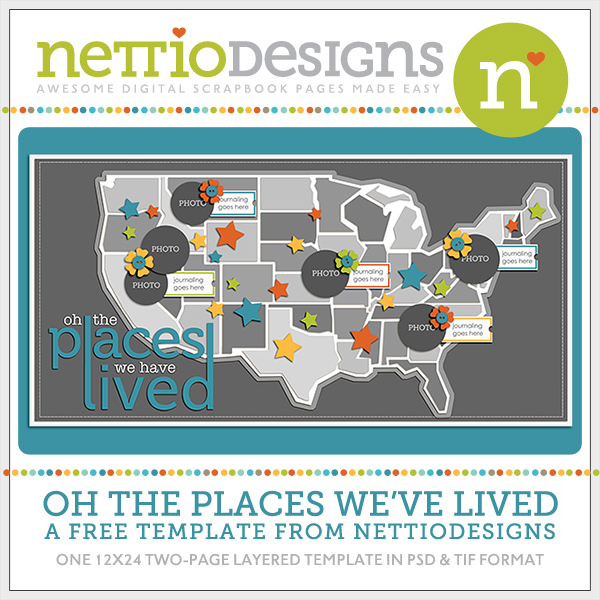 This is why I kept the design of these templates clean & simple – so you can embellish them however you like, whether it’s with photos, scrapbooking products or anything else. Because that’s the key, the more you want to stop and admire your design, the more often you’ll be reminded of your goals! 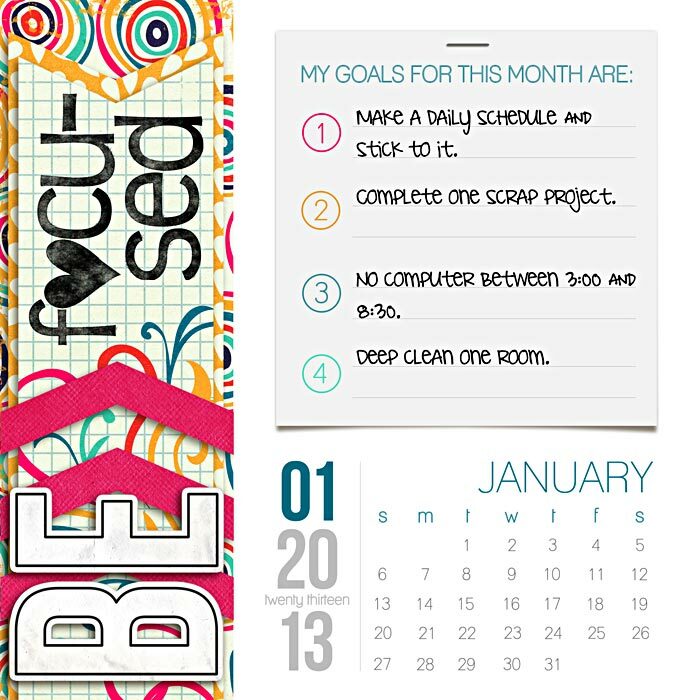 Here’s a look at what my January 2013 goal tracker looks like printed out. I have it hanging on my white board where I write out my to-do list so I’m sure to see it everyday. That’s what I love about these Goal Tracker templates. They can be creatively dressed up or down however you see fit. The only rule is that it inspire YOU to take action on your goals. 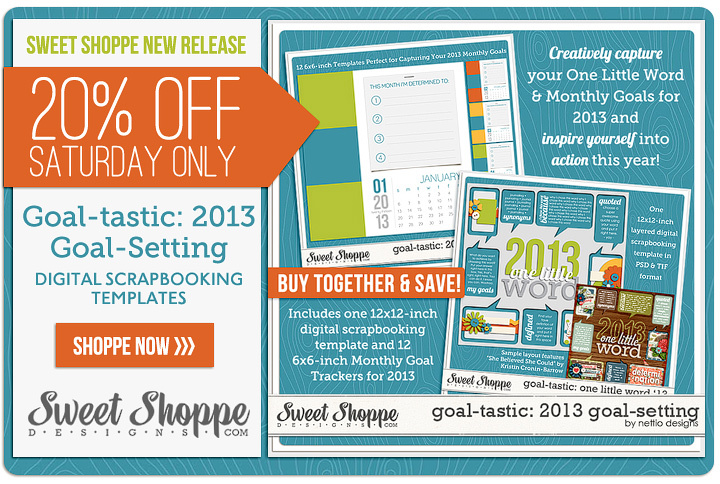 As with every Sweet Shoppe Saturday, you can save 20% off all three new releases thru Saturday. Want to save 20% off this weekend? 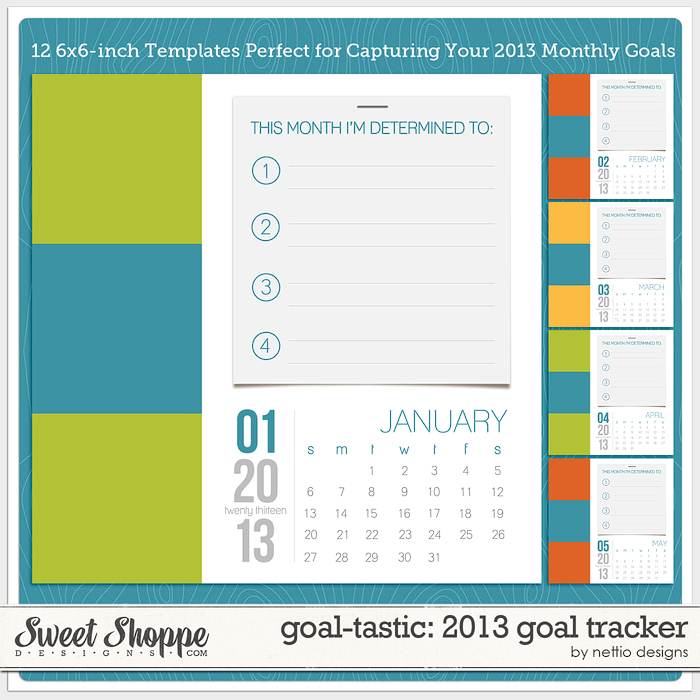 Pick up Goal-tastic: 2013 Goal-Setting here today! 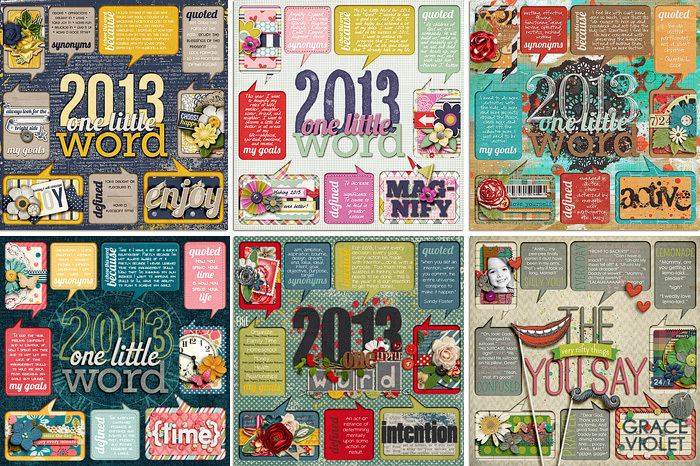 Welcome to One Little Word 2013. If you’re new to the idea of One Little Word, it’s super simple. All you do is select one word to keep in mind throughout the year. Last year I chose the word connect and I’ll admit, it manifested itself in a much different, but still good, way they I thought that it would when I chose it last year. But when January 1st finally rolled around, something about the word time didn’t feel right. It wasn’t that was a bad or irrelevant word, it just didn’t feel bold enough or actionable enough. It didn’t feel like it encompassed all I wanted to focus on this year. It was a fine enough word, it just didn’t feel like my word anymore. Later that night, Adam and I were talking and I mentioned how I was nervous about the start of the year because I had a lot I’d like to accomplish and I didn’t know if was really possible. And something about the word determination clicked. It felt right. But I wanted to be sure. So I did what any tech-lovin’ gal would do: I googled it. …I knew this was the word I needed for this year. Because it encompassed everything I had really wanted to get from the word time but in a way that’s much more powerful and really at the core of what I was looking for. So determination is officially my one little word for 2013. I even made a new layout for it – hey, why not use what you’ve got – that’s the beauty of digital, right? One thing I’ve known for months was that I wanted to combine my One Little Word this year into my goals for the year. If you follow Elise’s blog, you’ll know she did something similar for her word “choose” last year. And in her Big Picture I Choose class (which I highly recommend by the way! ), she talks quite a bit about the importance of not only setting monthly goals but of also capturing them in a creative way. So I knew I wanted to do something similar to what she did but with my own spin on it. 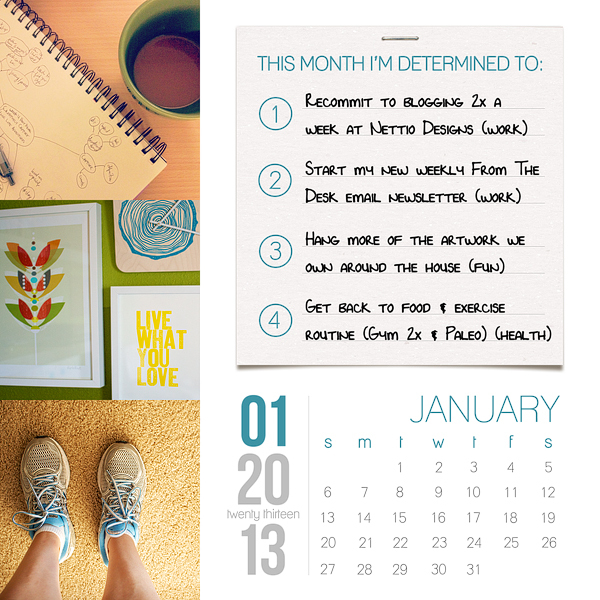 Something I could share here on the blog but also print out as a reminder of what I want to focus on that month. And I knew it to had to be simple enough to put together every month or else I wouldn’t do it. 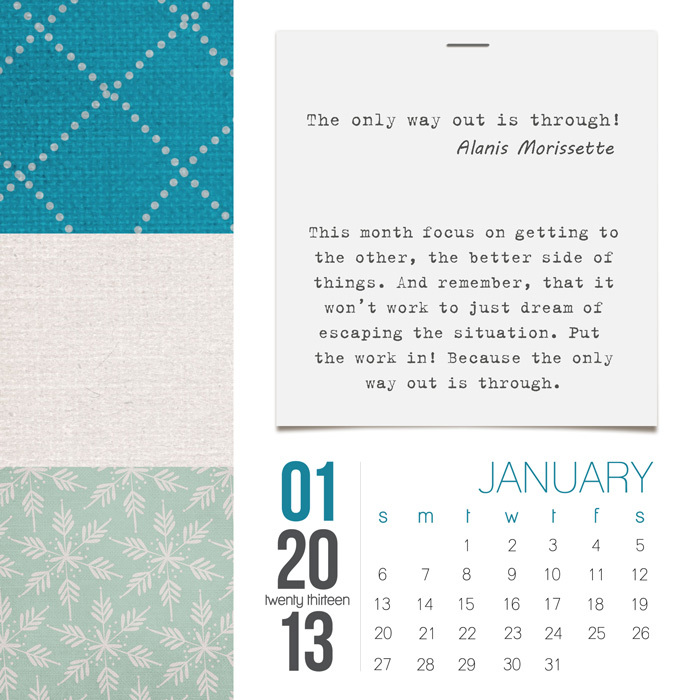 I came up with the idea to make a 6×6-inch goal-setting inspiration card to go with my monthly goals each month. My plan is to set 4 goals each month encompassing a good balance of life areas (something else Elise talks about in her class. You don’t want all your goals to be say, work-related since you’re likely to get burnt that way). Fun, right? I just printed it out here at home on Epson Premium Presentation Matte paper and trimmed it out with my paper trimmer. I like that it’s clean and simple but still a little scrappy. Very me, haha. Well that’s it for this January installment of One Little Word Goal-Setting! 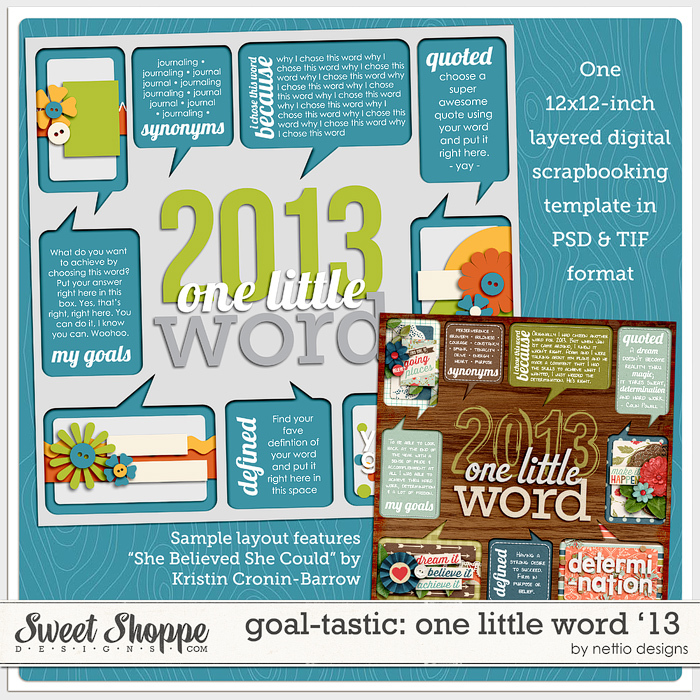 If you’re interested in making your own OLW layout or Monthly Goal inspiration cards, have no fear – both products will be hitting the Sweet Shoppe on Saturday. 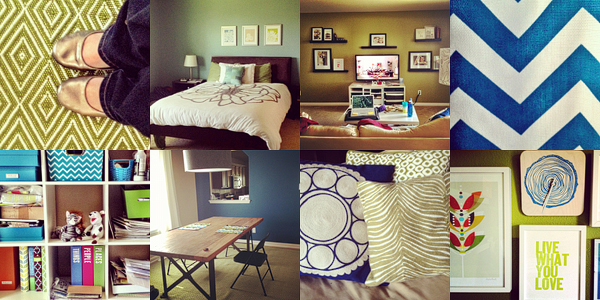 Just consider this an extra early sneak peek for all you lovely blog readers. 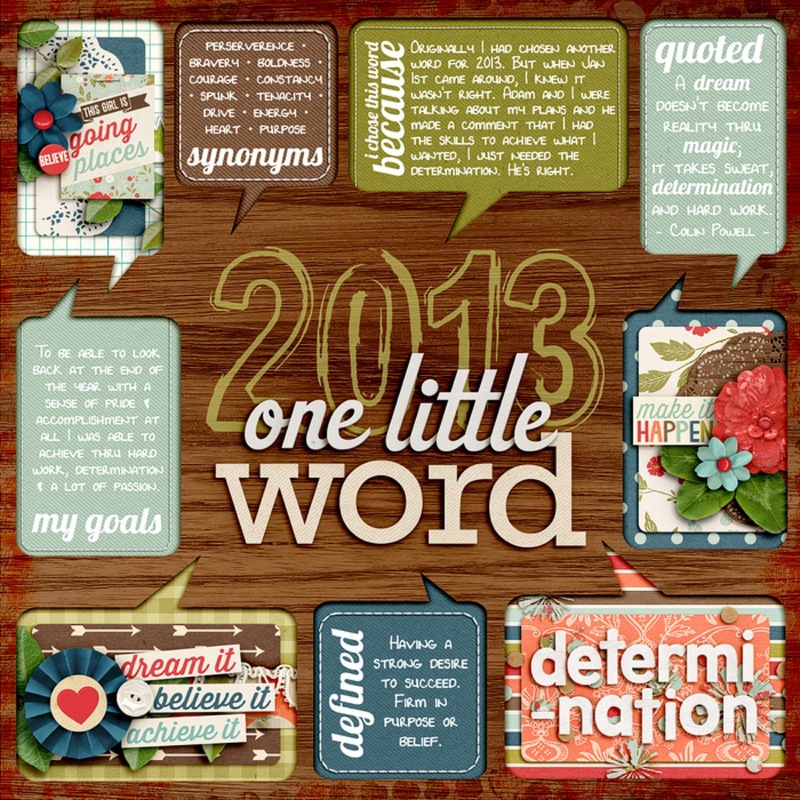 How about you – did you choose a One Little Word for this year? 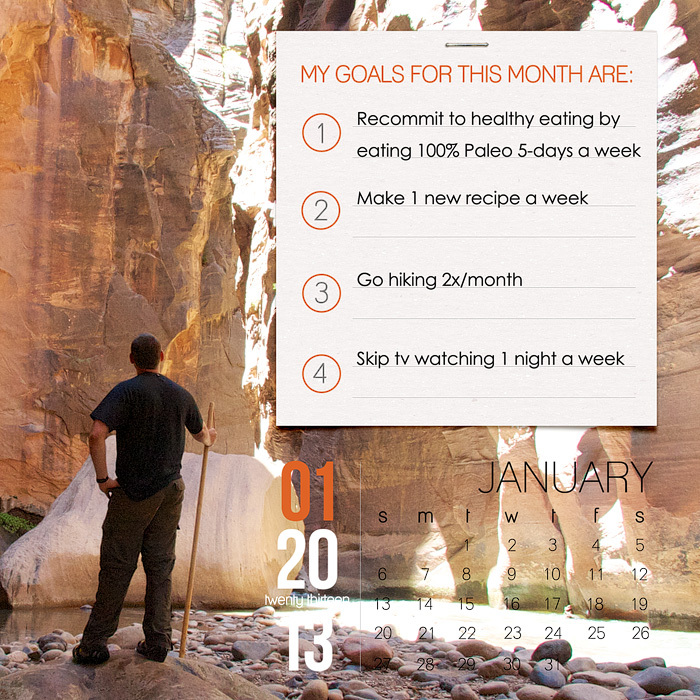 Did you set any monthly goals? Are you doing anything fun to document them? I love to chat so feel free to share what you’re up to in the comments below. Well, it’s official. We’re one quarter of the way done with 2012. 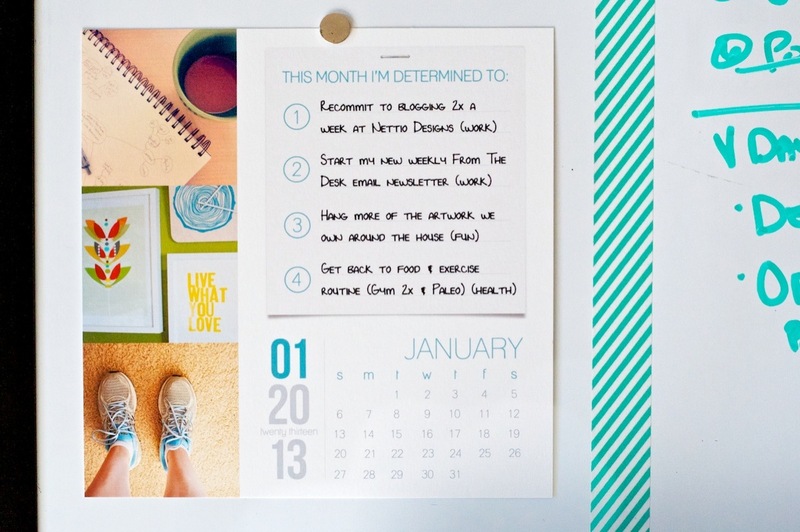 Have you made a quarters worth of progress on your 2012 goals? Yeah, that’s what I thought – me either. But I did write out a list of “wants” I wanted to focus on with my scrapbooking for this year, so now seems like a good time to reflect on how things have gone so far. I WANT…to trade the busy in favor of the meaningful. Busy? Yes. Meaningful? I’m not sure. To tell you the truth, I’m at a bit of an odd place in my scrapbooking right now – a place where I’m not totally sure I’m in touch with what exactly “meaningful” means to me anymore. In a way I’d say it’s the fallout of too much focus on busy scrapbooking the last couple of years. Once the busy-ness is stripped away, I’m not sure I know what I want to fill it with now. But I’m excited to dig into this idea more this year and really focus on finding out what meaningful means to me. I WANT…to push my creativity to the next level. Design and creativity are two of my favorite aspects of scrapbooking so for me this one was easy. I’ve definitely been pushing myself more this year and I’d say I’m happier with my layouts now than I was at the end of last year. Am definitely excited to continuing playing and exploring this year. I WANT…to stop allowing disorganization to limit my creativity and storytelling. Of all the items on my wants list, this one is still the biggest issue, and unfortunately, the one I’ve made the least amount of progress on. The 2nd Annual Great Computer Spring Clean-a-thon was a good start but what I really need is to make some MAJOR progress on my photo organization. I can’t be inspired by my photos if I don’t ever actually look at them in a creative and meaningful way. Look for lots of action on this one in the next few months. I WANT…to make time to scrap just for me. In the last 3 months I did manage to make this happen. Once. For my 30 Days of Lists mini album. But I know in order for this to happen more, I need to: a) commit to scrapbooking-only (non-designing/blogging) time and b) know what scrapbooking for me means, which again ties into the whole “what is meaningful to me” question from Want #1. I WANT…to tell the stories that matter most to me. See my answer for Want #1. Apparently it’s the answer of the day. 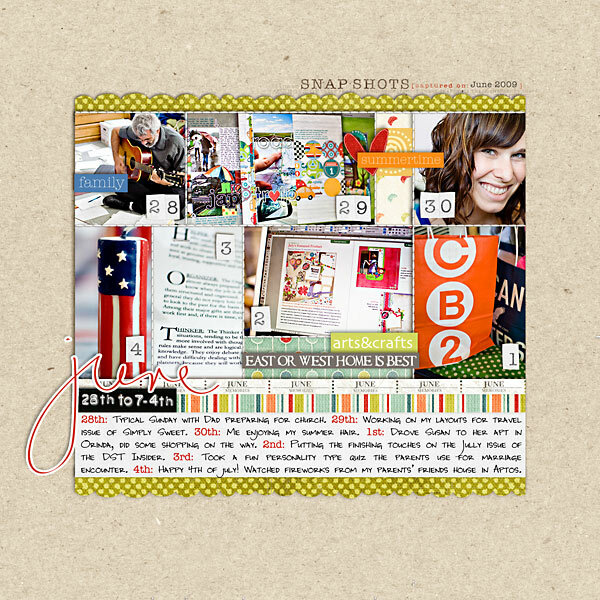 Well that’s my first quarter update on my 2012 scrapbooking resolutions. I wouldn’t say I’m off to a running start but I have started and that’s what matters. 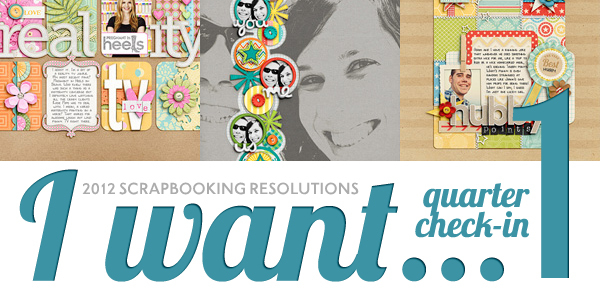 I’d love to know – how are your 2012 scrapbooking goals and resolutions going? Made any good progress? Happy New Year everyone! After two solid weeks of rest and relaxation, I am finally back in Texas and ready to tackle the new year! One of the great things about the past two weeks is all that downtime gave me a lot of time to think and reflect about the past year, my scrapbooking and where I want to go this next year. 2011 was a really interesting scrapbooking year around here. 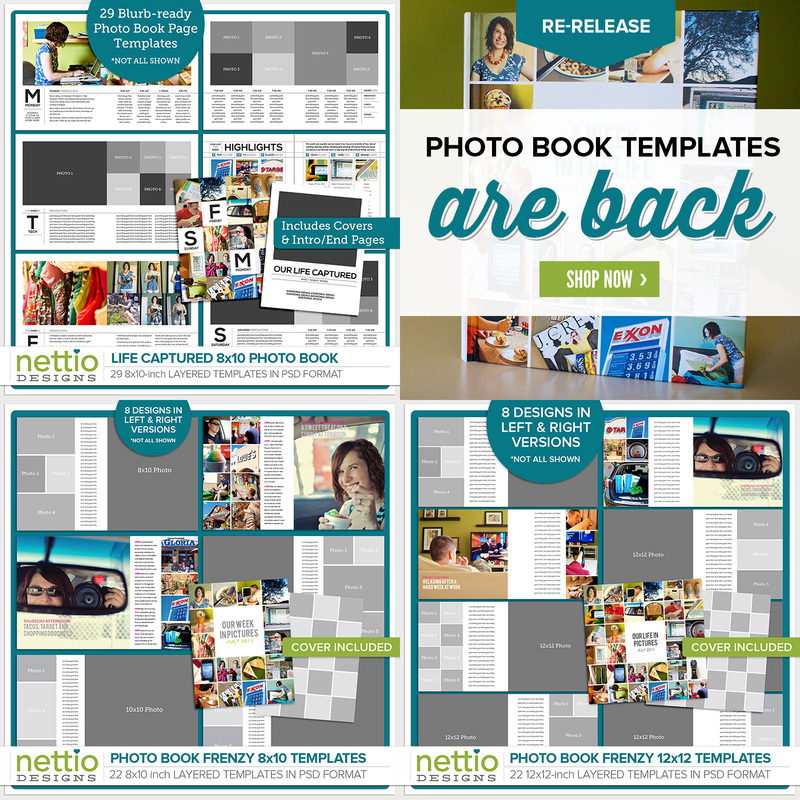 In addition to my regular scrapbooking and Creative Teams, I opened up NettioDesigns, celebrated my 5th Scrap-i-versary, guest taught over at Masterful Scrapbook Design and completed one of my favorite projects ever with my A Week In the Life photo book. But what I realized in looking through my layouts from the past year is that while I like the individual layouts I created, I feel like there’s a disconnect between the stories I want to be telling and the stories I’m actually telling – gaps where meaningful stories are missing. And if I’m being honest, I’ve been feeling this way for quite some time. In a lot of ways it feels like I’ve been on scrapbooking and storytelling autopilot, not necessarily disliking what I’m doing but not feeling totally fulfilled either. Peppermint of One Little Bird had a great post on her blog about this topic earlier this week and there was definitely lots of nodding going on as I read it. If you haven’t had a chance to check it out, I highly recommend you do. One of the key things I took away from her post is that when it comes to scrapbooking, there’s a difference between being busy and being meaningful. And when we try to do too much, especially with labor intensive projects like P365 or Project Life, we often sacrifice the meaningful in exchange for the busy work. The common thread with all three of the projects was that they kept me really busy – busy taking pictures, busy jotting down notes, busy buying supplies and organizing supplies. 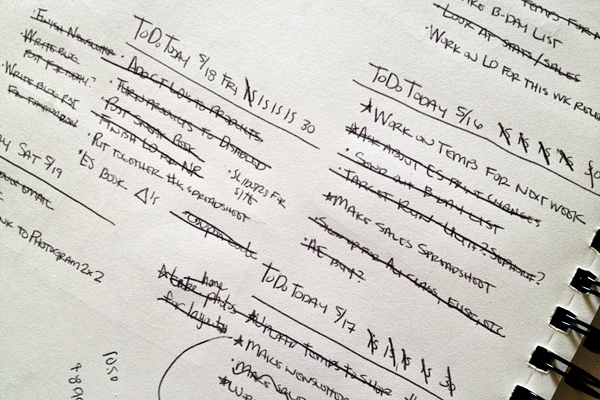 All of that busy work made me feel like I was documenting our lives. But they didn’t leave me feeling fulfilled. Instead I felt like I spent my time living up to arbitrary obligations that I’d set in my own head while ignoring what I truly love – which is sitting down at my computer and pouring my heart out onto a 3600 x 3600 px canvas in Photoshop. A photo from last week, a photo from last year, an experience from today or an emotion that happened to flutter through my heart. Can we say lightbulb moment? This feeling of scrapbooking and storytelling disconnect for me started in 2009 when I began my Deployment 365 photo-a-day project. At the time I chalked it up to Adam being deployed and life being in an odd state of flux that messed with my mojo. But looking back from the perspective of now, I’m realizing the other part of the story is I allowed the pressure of keeping up with that project (and others like it) distract me from telling deeper, more meaningful stories. 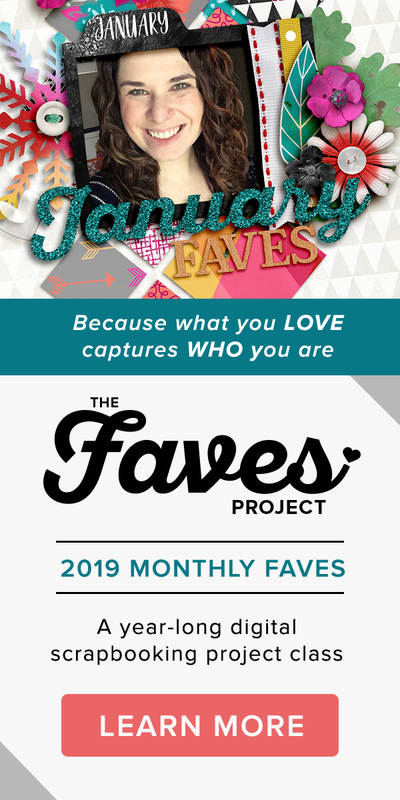 I listened to the little voice reminding me that I was way behind, that I wasn’t keeping up and I neglected what made me fall in love with scrapbooking in the first place – amazing designs and awesome stories. Don’t get me wrong, there were lots of things I loved about P365 and I have no intention of giving up projects all together. But I want to make sure in the future that any project I choose to take on, especially an ongoing time intensive one, is done out of a place of genuine LOVE and not only because it’s the it-trend of the moment. And if I get part way into the process and realize I’m not feeling it anymore, I want to give myself permission to let it go. To call it done and move on. I don’t want my unfinished projects of the past to limit my creativity today. 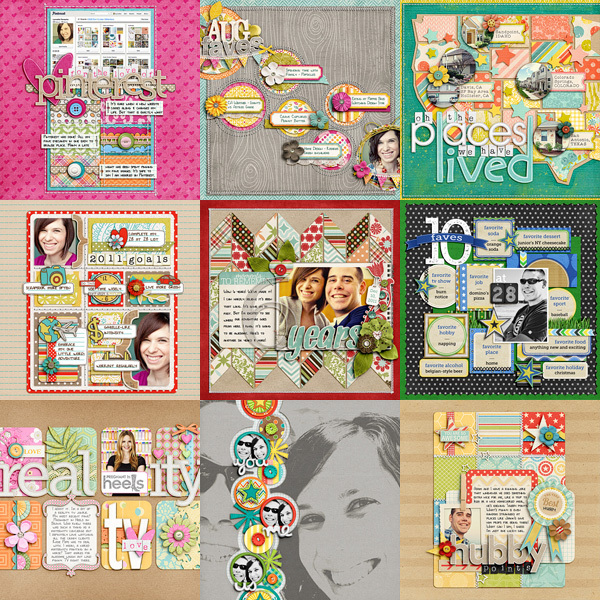 There’s no room for scrapbooking guilt around here. So with the start of the new year, I am ready to wipe the slate clean. To move on, let go of the guilt of old unfinished projects and get back to telling and creating the stories and pages I love. And to get things started, I decided to write a list of what I want to get out of my scrapbooking this next year. Since I’m still working on the Scrap-i-versary and Birthday Goals I set in 2011 these aren’t goals per se, but more like resolutions to keep in mind throughout 2012. 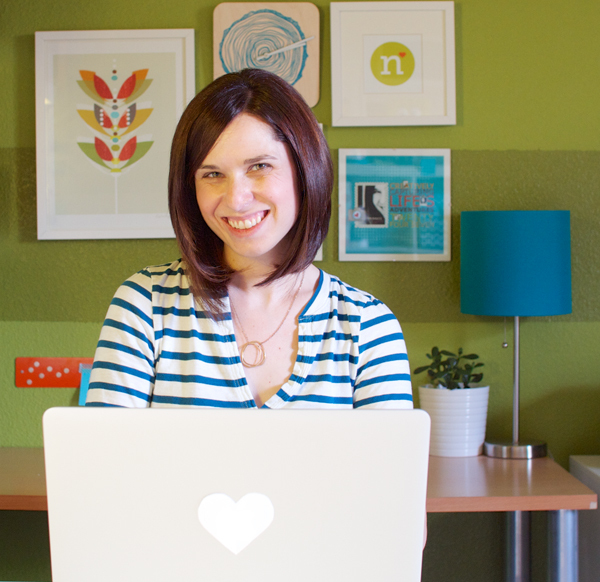 No more stressful guilt-inducing projects at the expense of meaningful pages. Unless I absolutely love the process (like my AWITL album), it’s not worth it. Challenge myself more. Expand my skills. Design pages that make me want to happy dance with creativity and excitement. My photos and supplies need to work for me. Reusing photos just to avoid hunting for new ones is craziness. Scrap for stories, not just to showcase product. And be ok with telling stories without product. 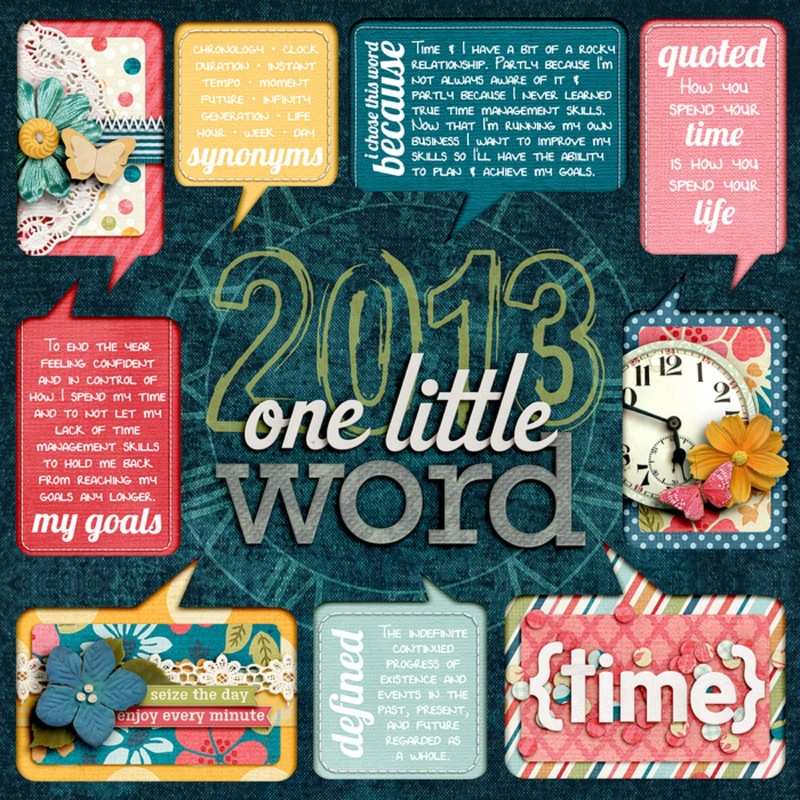 What’s one of your scrapbooking wants for this year?